Biking to a park on a sunny day: is this what sustainability looks like? Is it better for humans to interact with the more-than-human world, or should we be compartmentalized from the wild? I believe that one’s opinion regarding the sustainability of foraging can be traced to a single question: is it better for humans to interact with the more-than-human world, or should we be compartmentalized from the wild? Essentially, it’s a question of conversation vs preservation. The conservation philosophy generally holds that humans can and should harvest things from the land, but that it should be done in a way that ensures its use for all the generations to come. Meanwhile, the preservation mentality holds that humans should “leave no trace” on the land, or they will mess it up for everyone and everything else. Of course, most people aren’t completely black-and-white on the issue; but people typically lean in one direction or the other. The problem with preservationist thinking is that it assumes that humans are separate from nature. This thinking pervades modern society. It is evident in the language we use— things that grow in the wild are “natural,” while things produced by humans are “unnatural.” But where did those things originate? All items we possess, no matter how processed, trace their way back to Earth. (I guess that a few people own moon rocks or whatever, but I still consider things found outside of Earth to be “natural”— the sun, meteors, stars, etc.) Modern humans may be largely alienated from the wild— we buy our food from stores, use electricity to cover the darkness, depend on jobs and money for our day-to-day survival— but the wild is ultimately what supplies our modern lifestyles. How then can we be separate from nature, when nature is the very foundation that supports our lives? Humans alter the environment in our favor more than any other animal. One could argue that we’re separate from nature because we create human-dominated habitats. We alter the environment in our favor more than any other animal. Sure, beavers build dams that create ponds that eventually transform into marshes, but those changes in the ecosystem increase biodiversity, and therefore can be said to be beneficial. Building cities, on the other hand, creates a space specifically for humans. Sure, wild plants and creatures inhabit cities— as is evident by plants sprouting out sidewalk cracks, raccoons eating from garbage cans, and butterflies visiting our gardens— but the biodiversity is much lower than in rural and wilderness areas. But then what of black walnuts? Are they unnatural because they produce a chemical that favors only other black walnuts? Anyone who has these trees in their yard will testify to the difficulty of growing other plants beneath them. And what of fire ants? They are an extremely aggressive species that make regular sweeps of their territory, attacking and/or eating other insects, non-human animals, and humans. As a result, many species are pushed out of their habitat. Could this be “unnatural” behavior? Radioactive waste remains dangerous for around 10,000 years. Any human behavior that is called “unnatural” has parallels in the wild. To me, the problem is not that humans are “unnatural.” Rather, there exist a multitude of problems, one of which is the toxicity of human activity. Vast amounts of toxic wastes are produced by industrial operations, poisoning our air, water, and soil. There also exists a problem of scale; while other living things may damage the environment (such as black walnuts or fire ants), humans do it to a degree that affects the entire planet. Finally, there is a problem of balance; other animals may kill, consume, and change the landscape around them (such as beavers), but it usually plays a role in the ecosystem and promotes life overall. When humans do it, it often negatively impacts or destroys ecosystems and makes life difficult or impossible. 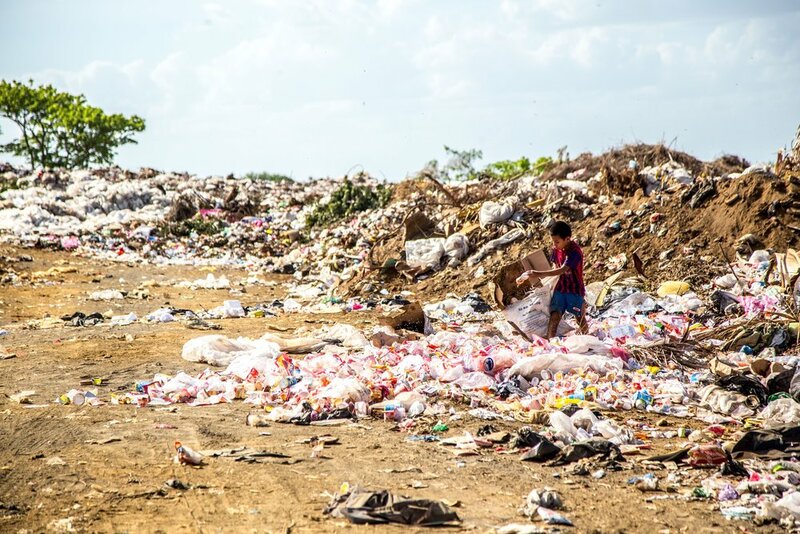 A child picks through a landfill in Brazil. I definitely understand where preservationists are coming from. Some species are too rare or fragile to be harvested. Additionally, there are nearly 8 billion people on the planet, and foraging alone can’t feed us all. If everyone met all their needs by going to wild spaces and harvesting items for food, shelter, clothing, and other necessities, ecosystems would indeed be ruined and many species would go extinct or drastically dwindle in numbers. On the other hand, one could argue that we’re at that point already. “Scientists estimate we're now losing species at 1,000 to 10,000 times the background rate, with literally dozens going extinct every day. It could be a scary future indeed, with as many as 30 to 50 percent of all species possibly heading toward extinction by mid-century.” (source) This alarming loss of life is hidden from most people, especially those of us living in modern societies. We carry on our days— living in a city and working and shopping and eating out at restaurants— not seeing the toll that our lifestyles take on other humans (especially those living in the Global South) and the more-than-human environment. Furthermore, it is estimated that 815 million people suffered from chronic undernourishment in 2016. (source) This is over 10% of the world population. While there is enough food produced on the planet to feed everyone (source), not everyone has access to income to buy nutritious food or land to grow it. And our capitalist system would rather see 1.3 billion tonnes of food go to waste annually (source) than feed those in need for free. Industrial agriculture promotes giant corporate control of our farms. Many people see an ever-increasingly industrial food system as the answer, but I see it as part of the problem. First of all, it does nothing to help equalize food distribution; in fact, I would argue that it does the opposite by promoting giant corporate control of our farms, whose only concern is their profit margins. Secondly, this system is unsustainable and wildly precarious. To site just one example: “Each year, an estimated 24 billion tonnes of fertile soil are lost due to erosion. That’s 3.4 tonnes lost every year for every person on the planet….The current high erosion rates throughout the world are of great concern because of the slow rate of topsoil renewal; it takes approximately 500 years for 2.5 cm layer of fertile topsoil to form under agricultural conditions.” (source) Further, “the Global Assessment of Human-induced Soil Degradation (GLASOD) showed that soil degradation in one form or another occurs in virtually all countries of the world. About 2,000 million hectares are affected by soil degradation. Water and wind erosion accounted for 84% of these damages, most of which were the result of inappropriate land management in various agricultural systems, both subsistence and mechanized [emphasis added].” (source) How can our current method of food production be sustainable when it’s literally destroying the soil it grows on? I am not suggesting that foraging alone can halt species extinction or end world hunger. The problem is much bigger than any single remedy can solve. It will take vast systemic change to address these issues. However, I do believe that foraging can be of aid to humans, non-human animals, and the planet in general in the meantime. But would increasing the diversity of our food system actually make it more sustainable? Wouldn’t we just overharvest wild plants and hurt delicate ecosystems? While there are cautionary tales, such as that of American ginseng, goldenseal, and wild leeks, studies indicate that “foragers [engage] in practices aimed at reducing harm and increasing plant populations.” (source) In general, species that humans depend upon become wildly successful, precisely because we need them. Just look at rice, wheat, cattle, chicken, dogs, cats, and other domesticated species. What if humans ensured the survival of, for example, northern hardwood forests, instead of one variety of soybean or potato? Celebrated forager Sam Thayer writes that “many of the beautiful ‘wild’ landscapes that European explorers and settlers encountered as they populated the American continent, such as Yosemite Valley, were actually carefully managed landscapes in which the Native Americans had hunted and collected foods and other materials for thousands of years…. [T]here is mounting evidence that many plants benefit from responsible patterns of human harvesting…. [P]opulations of the glacier lily Erythronium grandiflorum, once a staple food for some Native cultures, respond positively to disturbance caused when humans (or grizzlies) dig up the bulbs. Yet foragers are commonly admonished not to do this.” (Nature’s Garden, pp. 24) Imagine a food system that’s the opposite of our current one, with its reliance on monocultures, heavy use of toxic chemicals, dependence on fossil fuels, and suppression of small-and-medium scale operations. Foraging is exactly such a system. Getting food from the wild means that biodiverse entities such as forests are supported over toxic, large-scale, out-of-balance entities like corn fields. Vertical gardening in Milan, ItalY. There are currently 1.5 billion hectares of land used in crop production. (source) Meanwhile, it is estimated that between 110 million and 130 million hectares of land on Earth are urbanized. (source) This equals about 8.7% of land used for crops. While it may not seem like a high number, it represents land largely unutilized for food production, and most often not even considered for food production. What if, in a bid to make our cities more biodiverse, food secure, and resilient, we planted food forests from which locals could harvest food for free, and increased access to public lands for foraging purposes? It isn’t out of the question. Many cities are already instituting such policies, and the Berkley Food Institute has a detailed fact sheet with public policy recommendations to encourage urban foraging. This would open up a source of free, nutrient-dense food to those who need it. Hardly mentioned in discussions about the sustainability of foraging are the prolific amounts of invasive plants that are edible and delicious. Just a few examples include garlic mustard, autumn olive, wild parsnip, and kudzu; additionally there exist many “weedy” plants that are sometimes considered invasive, such as dandelion, burdock, wild carrot, and lamb’s quarters. Instead of spraying dangerous herbicides, why not just eat them? I myself have held a garlic mustard workshop in conjunction with the Minneapolis Parks, in which participants learned how to identify and pick garlic mustard for the purposes of invasive species removal. But instead of throwing them in the trash, we took them to the kitchen and cooked them! It’s hard for me to believe that a concerted effort of foragers would fail to make a dent in the garlic mustard (or other invasive species) population. This, in turn, would promote biodiversity and help the ecosystem, encouraging balanced interactions with the more-than-human world. Beyond this are native or naturalized species that grow and reproduce prolifically, and are therefore at low risk for endangerment. To quote Sam Thayer from his book Nature’s Garden (pp.23), “The misbegotten belief that foraging harms the environment is based on two prevalent myths about Nature: its scarcity and its fragility. Jared Diamond presents the ridiculous (and uncited) figure that in natural plant communities, 0.1 percent of the biomass belongs to species that produce food for humans. Obviously, he is not a forager, because he has missed something— or should I say, almost everything. Where I live, the average figure is closer to 60 percent, and in many places it approaches 100 percent. The biomass of edible plants is similar over much of the continent. How much of this forest do you think is edible? The abundance of wild foods may surprise you. “Every time I hear this ridiculous underestimation, I think of places like Hopniss Valley, where virtually all the biomass belongs to an assortment of several dozen edible plants, and the namesake vine produces thousands of pounds of tubers per year. I think of the vast wetlands along the Mississippi River, where a ‘patch’ of lotus or wapato covers hundreds of acres, and each acre produces more food than I could eat in a year. I see the miles and miles of California foothills that, despite human abuse, bring forth millions of bushels of acorns. I see fields of camass in Idaho, parsnip in Iowa. I envision the desert washes in Arizona, from which millions of pounds of amaranth sprout after summer downpours. I envision the endless nut groves of the South, persimmon fence lines, and the millions of acres of untapped sugar maples in the Northeast. So is foraging sustainable? It’s a difficult question to give an all-encompassing answer. The sustainability of foraging depends upon many factors, including the forager, the species being harvested, the amounts being picked, and the habitat. Still, my inclination is that when people forage correctly, yes— it is sustainable. While there are horror stories of people breaking branches to pick fruit, digging every last wild leek from an area, or trampling endangered plants while searching for mushrooms, there are many more people who forage conscientiously. Foraging reminds us of our connection to and dependence upon nature, thus making us more likely to become responsible stewards of the land. And in this era of increasingly toxic practices, rapid species extinction, and global climate change, we certainly need more of that. This blog post was chosen in a poll by Patreon members. Thank you for your support!